The Jains are known for their food restrictions. On certain days of the month, many observe abstinence of even vegetables and greens. This is known as ‘sukha khana’ as as opposed to ‘lila khana’ which means a meal consisting of vegetables and greens. 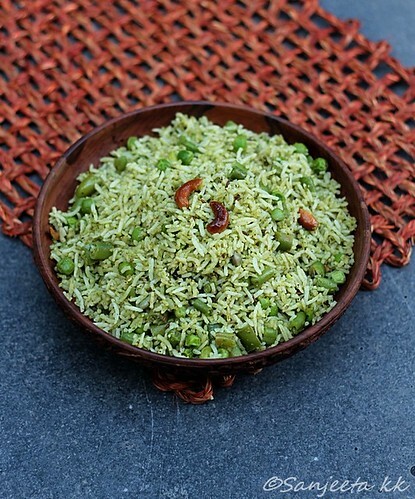 Hence the name ‘lila pulav’ means a rice dish with vegetables. For Great Granny Hasumati Shah, this rice dish is a cherished childhood memory. It is rich with the flavour of coriander leaves as well as coriander seeds. 1. Wash and soak the rice for 10 minutes. Now boil the rice until each grain of the cooked rice is separate yet soft. Strain and set aside. 2. Steam the beans and peas until cooked. Strain and set aside. 3. For the paste, add 1 teaspoon oil in a shallow pan. Add the cloves, cumin and coriander seeds and allow to roast on a low flame. After 1-2 minutes add the grated khopra and continue to roast for 2 more minutes. Remove from flame and grind the roasted ingredients with the coriander leaves and green chillies into a thick paste adding very little water. 4. In a pressure pan, heat the remaining ghee and add the ingredients of the tempering. When they begin to crackle and let out their aroma, add the paste and lower the flame. Saute for 3-4 minutes. Add salt, steamed vegetables and rice and sauté for 2 more minutes. 5. Add lemon juice and garnish with chopped coriander leaves. Gently fluff the rice with a fork and serve fresh with raita. This recipe was first published in The Great Granny Diaries – a column in Harmony Magazine. Part-1 of this post is the interview with Hasumati Shah, a Gujarati great-granny from Chennai.